With exams on the go, we decided to try lift your spirits with two awesome competitions and who better to partner up with than weFix! All because we want to #MakeItBetter. 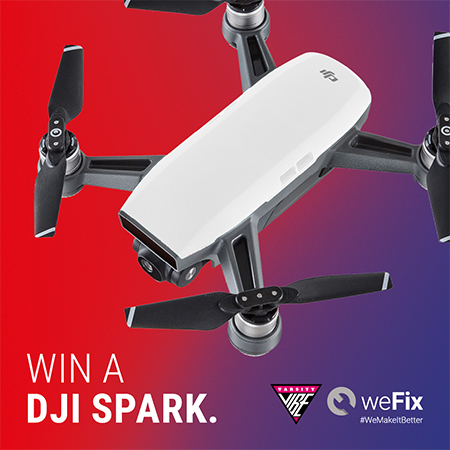 WIN 1 of 3 x R1000 vouchers that can be used at any weFix for ANY repair and/or accessories. Then post it on your story and tag us! Competition finishes on 15 June 2018! This competition is available to STUDENTS ONLY! Please note that Terms and Conditions do apply. Don’t think you can operate a DJI Spark…well she can: This little guy is soooo cool. Check this video and get a taste for what it can do… Competition finishes on 17 June 2018!